^ 體育中心／綜合報導. 「姆斯」詹姆斯感懷身世　肯定林書豪逐夢！. ETtoday 東森新聞雲. 2012-02-23 （中文（台灣）‎）. ^ Lynch, Andrew. Here's why LeBron James is the best NBA player of all time. FoxSports. May 31, 2017 [May 12, 2018]. ^ Fromal, Adam. LeBron Is the Best Player the NBA Has Ever Seen, Even If He's Not the GOAT. Bleacher Report. April 27, 2017 [May 12, 2018]. ^ Armen-Graham, Bryan. It's time to call LeBron James what he is: the NBA's greatest ever player. The Guardian. June 11, 2017 [May 12, 2018]. ^ Baillie, Ryan. LeBron James Is The Best NBA Player Of All Time And It Is Time To Accept It. Odyssey Online. December 4, 2017 [September 14, 2017]. 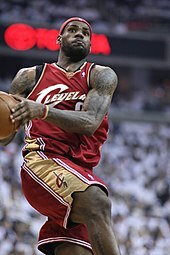 ^ 19.0 19.1 espn.com, LeBron's playoff debut triple-double carries Cavs, accessed 2007年5月1日. ^ espn.com, Cavaliers Win Series 4-2, accessed 2007年5月1日. 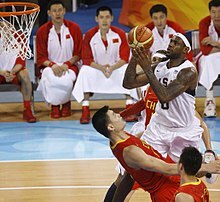 ^ YouTube上的LeBron James becomes youngest player to score 10,000 points! ^ Golen, Jimmy. James hits milestone but Cavaliers fall to Celtics 92-87. 美聯社/Yahoo! Inc. 2008年2月27日 [2008-03-01]. ^ Beck, Howard. James Does His Best to Top Bryant's Garden Performance. New York Times. 2009-02-04. ^ Beck, Howard. On Second Thought, One Fewer Rebound for James. New York Times. 2009-02-06. ^ YouTube上的LeBron James scores 55 points against the Bucks! ^ Howard, Bryant headline 2008-09 NBA All-Defensive First Team. NBA.com. 2009-05-06. （原始内容存档于2009-05-08）. ^ espn.com, NBA announces All-Star starters, accessed, February 18, 2010. ^ Cleveland's Venom Validates James's Exit. 紐約時報. 2010-07-09 [2010-07-26]. ^ Berman, Marc. Triple-double gives LeBron last laugh as Amar'e streak ends. New York Post. 2010年12月18日. ^ Washburn, Gary. MVP clear choice. Boston Globe. [2012-06-22]. ^ Simmons, Bill. LeBron Makes LeLeap. Grantland. [2012-06-22]. （原始内容存档于2012年6月24日）. 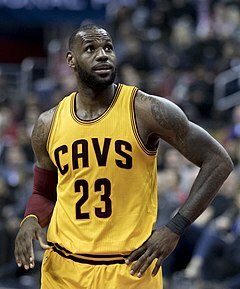 ^ LeBron James only takes 2-year contract with Cavaliers, 2014-07-13. ^ LeBron James is going to keep signing 1-year contracts, and it's going to make him a ton of money, 2015-06-29. ^ 騎士擊敗塞爾特人 詹皇連8年晉級總冠軍. 世界日報. 2018-05-27 [2018-06-02]. （原始内容存档于2018-06-02）. ^ 鍾東穎. 學詹皇一口氣乾杯　柯瑞靠腎上腺素撐到G7. NOWnews. 2018-05-27 [2018-06-02]. （原始内容存档于2018-05-28）. ^ Smith, Sekou. U.S.-Australia Game Blog!. NBA.com. [2012-08-09].